John Lewis and Nate Powell’s comics biography March, reviewed. 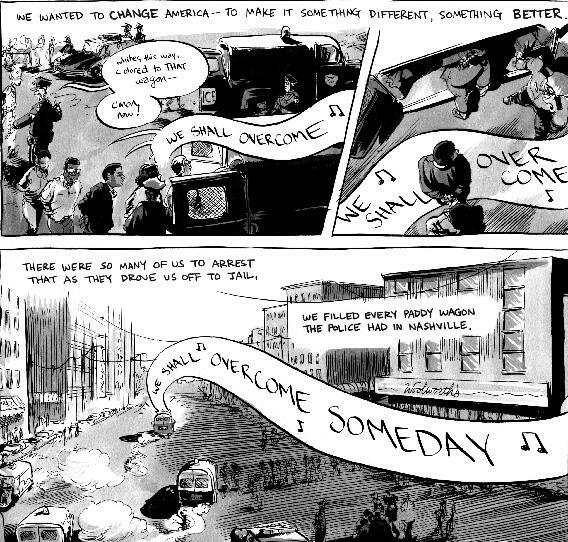 A new comics trilogy tells the tale of Rep. John Lewis and the struggle for civil rights. On Feb. 7, 1960, a group of nonviolent activists staged a sit-in at the Woolworth’s lunch counter in Nashville, Tenn. Among them was a young student named John Lewis, who would become one of the “Big Six” leaders of the civil rights movement and, eventually, a congressman representing Georgia. March, a new trilogy of graphic memoirs (Book One is out next week), tells the story of Lewis’ life, from a tiny chicken farm in Pike County, Ala. to the steps of the U.S. Capitol. Co-written by Andrew Aydin, March derives a great deal of its emotional power from the evocative artwork of Nate Powell, an Eisner- and Ignatz-winning cartoonist best known for his own remarkable graphic novel Swallow Me Whole. Powell’s drawings in March combine the epic sweep of history with the intimate personal details of memoir, and bring Lewis’s story to life in a way that feels entirely unfamiliar. March is shaping up to be a major work of history and graphic literature, and we’re very pleased to have Nate Powell illustrating the August issue of the Slate Book Review. March, Book One by John Lewis, Andrew Aydin, and Nate Powell. Top Shelf Productions.